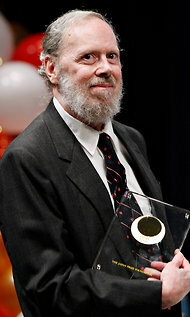 Tonight’s Kaddish is for Dennis Ritchie, the father of the C programming language and the UNIX operating system, among other accomplishments, who died yesterday at the age of 70. The last several nights I’ve been writing grumpy posts about recording Kaddishim in the wee hours because of long, long work days as a software geek, but the truth is I have a pretty great job, and I owe a lot of it to the likes of Dennis Ritchie. I cut my teeth on UNIX when I first got started in computer work back in college, and UNIX is the underpinning of the Mac OS X operating system I’m still using today. A UNIX lookalike named Linux is what beitmalkhut.org’s web server is running. And most of the software that I’m using on this computer is written in one variant or another of Ritchie’s C programming language. This entry was posted in kaddish in two-part harmony, podcasts and tagged C, Dennis Ritchie, Linux, UNIX. Bookmark the permalink.